Thanks to our Carestream cone-beam scanner, we’re able to create highly-detailed 3D X-ray images of the mouth and head while exposing our patients to very low doses of radiation. This kind of image enables our practice to diagnose and treat a wider array of dental issues in-office, helping patients accomplish more in fewer visits to save both time and money. These 3D images allow Dr. Franzen to get a much better look at a patient’s dentition without having to send them to an outside lab to capture special X-rays. Because he’s able to see more, he’s able to formulate more accurate diagnoses, which leads to an overall higher-quality of treatment. 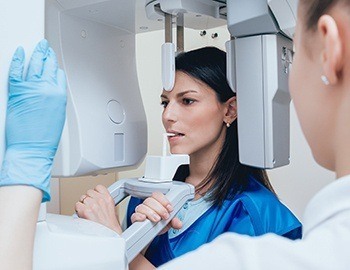 We often use our cone-beam scanner to help with dental implant placement, extractions, root fractures, and third molar (wisdom teeth) evaluations. Using this device, Dr. Franzen can gain a more global understanding of a patient’s dental anatomy in order to create more personalized treatment plans. That way, not only will a procedure itself be successful, but the recovery will be faster as well. In the end, it’s just another way we provide you with the very best that dentistry has to offer. To learn more about our technology or schedule an appointment, contact us today.